Some people think that making healthy choices when on a budget is expensive and therefore revert to their discount fast foods and unhealthy choices to save money and time. It doesn’t have to be this way. If you sit down and figure out how much you spend during the week on all food items including your daily coffee breaks, you will come to understand that healthy choices benefit not only your body but also your pocketbook. 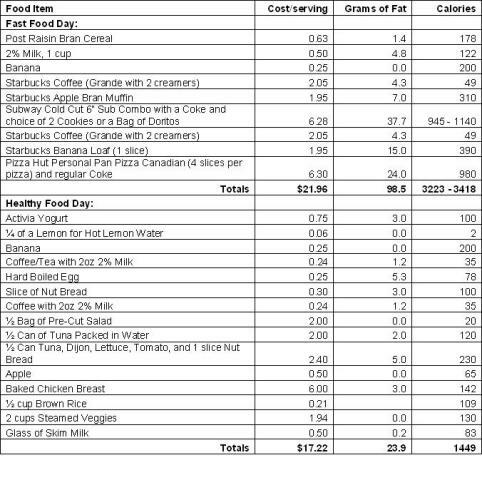 A typical day of eating for the average fast food consumer might consist of: Raisin Bran cereal with 2% milk, a piece of fruit and a cup of coffee; followed by a Starbucks coffee break with an apple bran muffin; a Subway 6” cold cut combo with a soda and two cookies or bag of chips for lunch; another Starbucks coffee and a slice of banana loaf for an afternoon snack; and finally for dinner (working late, don’t feel like cooking anything) a take-out pizza – Pizza Hut Personal Pan Pizza - and another soda on the way home. Incidentally, a Teen Burger, fries and large soft drink from A&W yields roughly the same number of calories as the cold cut combo from Subway, provided you chose the cookies over the Doritos. Who would have thought?? Nutritional Analysis: high starch intake will give you an initial boost of energy but will flood your system with glucose resulting in a sugar crash and lack of energy which will perpetuate the craving for more starches in order to bolster your energy levels. High fats will give you a feeling of satiety but your body will end up lacking the nutrients to perform efficiently. Without a solid supply of phytonutrients from fruits and vegetables your body will lack the ability to properly repair itself. Now that's what I call a budget deficit! On the other hand, if you were to go shopping with a meal plan in mind for the week you could come up with the following: hot lemon water (to help clean your blood), yogurt, a banana, and a cup of coffee/tea for breakfast; a hard-boiled egg, a slice of nut bread, and a cup of coffee or water for mid morning coffee break; ½ bag of precut salad, ½ can of tuna and a cup of water for lunch; the other ½ can of tuna mixed with Dijon mustard and topped with lettuce and tomato on a slice of nut bread, and an apple for a mid afternoon snack; a baked chicken breast, ½ cup brown rice and 1-2 cups of steamed veggies for dinner; and a cup of skim milk for a mid evening snack. In this example all food is brought from home (brown bagging it), the coffee/tea can be made in your office kitchen at work, and dinner food such as baked chicken breasts and rice can be made ahead of time and refrigerated or frozen for days when time & energy is an issue. Nutritional Analysis: antioxidants and phytonutrients from the fruits and vegetables coupled with the clean protein sources and required calcium sources provide a good foundation for the body to operate efficiently and to repair itself. You see, you can make healthy choices while eating on a budget. Let’s put this in to perspective. If you’re taking in the sample fast food menu, you’re taking in roughly 3,000 – 3,500 calories per day. Are you active enough to support this intake? Let’s say you’re an office worker and don’t have a whole lot of exercise planned during the week. If we’re generous and say you require 2,500 calories per day to maintain your current weight, then that’s an extra 500 – 1,000 calories per day. Do you know what your body does with excess calories? It stores them as fat. 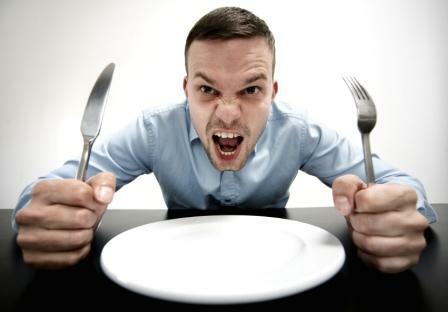 An excess of 500 – 1,000 calories per day translates into 182,500 – 365,000 extra calories per year. Now, a pound of fat equals 3500 calories. So these figures could potentially add 52 – 104 additional pounds to your frame over the period of one year. It’s no wonder that most people are struggling with their weight these days. Taking your budget into account, the healthy choices (buy your own groceries and prepare your own food) menu saves you roughly $5.00/day. Saving $5.00 per day helps you save an extra $1,825.00 per year. START MAKING HEALTHY CHOICES AND PACKING YOUR OWN FOOD! Click here for healthy alternatives to take-out foods that you can make in your own home. All figures are based on nutrition information from package labels, calorie counter indexes and fast food company nutrition postings. Pricing reflects local grocery stores and restaurants in Calgary, Alberta. Just because you’re eating on a budget doesn’t mean you have to sacrifice your health. On the other hand, if you must eat out, click here to see some healthy choices while dining out.